These delightful stories, by former British Merchant Navy sailor, Gordon Sollors, were written for his grandchildren, Christopher and Madeleine, who asked him to tell them about "the olden days". Gordon joined the British Merchant Navy as a Deck Boy, in March 1942, when he was only 14 years, 7 months old. His first ship was the troop transport Orion, followed by the tanker British Faith. Gordon also served aboard the troopships Highland Brigade and Empress of Scotland , as well as the cargo ships St. Clears and Marvia, and the Liberty Ship Frank A. Vanderlip. Gordon sailed often on the dangerous North Atlantic. The following 3 stories are mainly about his experiences on the MV British Faith, one of the Britsh Tanker Company's splendid fleet. By the time that Gordon joined the crew of British Faith, he had reached the elevated age of 15! Gordon served aboard her from November 1942 until March 1943 -- the coldest winter of the war. During the Normandy Invasion in June 1944, British Faith served as a fuel supply ship for 3 dangerous weeks, until fuel depots could be established ashore. After the war Gordon married and he and his wife, Doreen emigrated to Tasmania, Australia, where they raised their family. In 1993, he completed a Bachelor of Arts Degree from the University of Tasmania - an accomplishment which is a little bit out of the ordinary for an ex "Peggy Boy"! 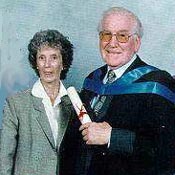 This photo shows Gordon "50 years on", accompanied by Doreen, at his university graduation. "Here you are son." Bert had to shout to be heard above the combined din of the weather outside, and the continual throb of the ship's engines directly below his galley. "If they want any "afters," they will have to come for it themselves." Bert Wheeler was the ship's cook, and where the handling of food was concerned, his word was law. The "they" in his statement referred to the sailors for whom I, as a Deck Boy, had to fetch and carry at meal times. I was the sailor's "Peggy". 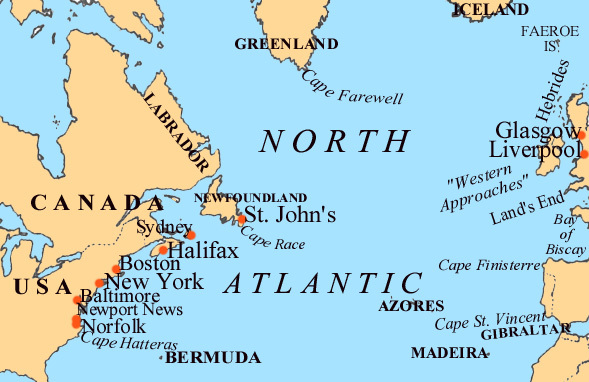 The place was mid North Atlantic, and the time was December 1942. A gale was blowing, which even by North Atlantic standards was severe. We were part of a convoy of some forty odd ships bound for New York. Click Here for Map. This photo of a convoy at sea, shows each ship followed by a long wake. Convoys travelled at the rate of the slowest ship -- in good weather, probably about 8 knots (10 mph). This photo which belongs to Graham McBride, is from the book On the Triangle Run by James B. Lamb. Toronto: Macmillan, c.1986. The ship, the M.V.British Faith was a fairly ancient tanker, built sometime in the 1920's. It had no shelter decks, and my journeys back and forth from the mess room to the galley had to be made via the very exposed flying bridge. Even in ballast, the old ship sat so low in the water her decks were almost continually awash, making my job - even with "one hand for myself, and one for the ship" - a health hazard! Here is the British Faith in "better times". This photo is courtesy of Frank J. Wheal, of London, England. Frank served aboard British Faith as her Deck Boy in 1941. The prevailing conditions of gale force winds and mountainous seas, of decks constantly awash with hundreds of tons of water, made the spray almost as lethal as buckshot. Because of this, my journeys along the flying bridge, whether carrying food or not, were not always in the best interests of my general health and welfare, nor, as you can imagine, to the edibility of the food by the time it reached the mess room table! These circumstances, although entirely beyond my control, often presented some of the less mature sailors with all the justification they needed to make my life even more miserable than did the elements! Bert, the cook, was a kindly man. After a previous incident in which I had been forced to abandon the food to the sea in order to save myself from the possibility of being washed overboard, he had made a rule that during such lousy weather he would only allow me to make one trip per meal with food. If the sailors wanted their "afters" and hot water for tea and washing up, they would have to come to fetch it themselves. Sentiments need I add, with which I wholeheartedly - although secretly - agreed. On several occasions during that trip, when I had returned to the galley for the rest of the sailors' meal, Bert would just put a plate of food for me on the galley table, and tell me to "get stuck into that." No amount of protest on my part would shift him, he would just say, "They will be down in a minute," and usually, they were! Some of them didn't like it, but Bert was a good cook. I don't think they wanted to get on the wrong side of him. When presenting for duty in such weather, I probably looked a slightly ridiculous figure. All five foot two of me. I wore thigh boots which were kept up by rope yarns tied to my belt. I wore a huge oilskin coat which was brand new, and was as stiff as a board. I had to gather the coat around my waist with a short length of thin rope. Otherwise I'm sure that, had the wind got under it, I would have become airborne! I could not afford the niceties of an oilskin with elasticated cuffs, so I had to have someone tie the sleeve ends with rope yarns to prevent the discomfort of water blowing up my arms, and again, possible lift off! To cap it all, I wore a large sou'wester which would have done justice to a John West Salmon advert, tied firmly under my chin. All of which protective clothing, essential as it was to my general well being, lessened my agility, which did not help my on-going contest with the elements. After many days of such weather, I became proficient at timing my runs along the flying bridge to avoid further disasters with the sailors' food. I'm sure you've all done it. From the relative safety of the leeward side of the bridge housing, I would watch the bow lunging in and out of the waves, and each resultant wall of water crashing over the windlass. Even as the last wave was breaking over the windlass, I would be up and running, kits swinging as little as possible. Across the fore part of the bridge, on to the flying bridge. As the bow would be pointing to the sky, and perpendicular to the horizon, (wherever THAT may have been), I would be rounding the mast, and heading like a bat out of hell for the fo'c's'le head, turning round to whichever was the leeward side, down the ladder, and into the safety of the fo'c's'le. All this, one hoped, without spilling a drop of soup!!!. I became adept at dodging, but never contemptuous of the elements. Should I have mis-timed my run on any occasion, I risked the very real danger of being caught by a wall of water, and hurled down to the deck below like a bag of rags. The sailors would then have had to have collected their own lunch!!! Bert Wheeler: Cook extraordinaire. Probably mid thirties. Short on stature, tall in humanitarian principles. Balding. Invariably a smile. If he was married, I hope he had children. I'm sure he would have been an excellent father. I hope you achieved your cafe in Weymouth after the war, Bert! John O'Hara: Bos'un. About 40. Accent as Irish as a shillelagh. Shaved now and then. Red to purple face. Good at his job. Worked like a Navvy and expected everyone else to do the same. Attitude to me quite good. Jock: A.B. I'm sure he had a surname, but I never knew it. Man in his 50's. Kindly disposition. Softly spoken. Always considerate toward me. Liked his Scotch. Peggy: Gordon Sollors. Sometime Deck Boy, Ordinary Seaman, E.D.H., and Able Seaman. In those days, I was from the U.K. For the last thirty years have lived in Australia. Would like to hear of or from Mr. Francis Whiting of Tamworth, NSW. He was an Ordinary Seaman on the S.S. Marvia with me in 1944-5. We paid off in Malta in April 1945. Last seen at Princes Landing Stage, Liverpool. Please Click Here to read Gordon's next story, Christmas in America.